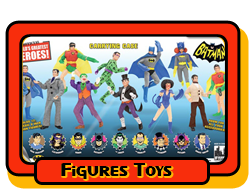 I was perusing FTC's website, looking at the various Batman figs (not the '66 ones) to see which is best for a custom I've been wanting to do, and wow, at least in the pictures, the blue really varies from version to version. Are they really that different, or is it just the photos? For example, the Justice League Batman looks like a really light blue, while the Superfriends and first appearance Batmans (Batmen?) seem much darker. Are they all as different as the website photos make them look? Anybody with them on hand who can compare, or who has a display showing them side-by-side and can snap a pic or two, I'd be grateful . . .
I’m not home and don’t have Batmans handy, but to answer your question, yes. FTC has produced multiple versions of what is mostly the same figure with slight costume variations and the colors including head,, boots and cape can differ quite a bit in shades of blue. Yes, there is a lot of variety. The SF batman is a royal blue and colored properly IMO. The SF batman is a royal blue and colored properly IMO. This is my favorite one so far ... mostly due to the colors. I think the Justice League Batman’s colors are nice too. This is something I like about FTC--the variety. You can kitbash a figure that is classic and sort of "Mego 2.0." My recipe: Classic (1st retro reissue) head, boots, & belt; SF suit and gloves, Mattel cape. Looks awesome. I'm toying with trimming the snap-on gloves into cuffs and adding blue hands. I saw Brian Leitner did that and it looks great. ...I'm toying with trimming the snap-on gloves into cuffs and adding blue hands. I saw Brian Leitner did that and it looks great. Do you have a link? I wouldn’t mind seeing that. I'm trying to recall if it was here or on his site. It looked to me like he cut the hands off and trimmed the inside of the gauntlet to slip on like a cuff. It gave the effect of a 12" magnetic-Batman style. Wow, you and I are 95% aligned on that plan -- that's why I was wondering how all the colors shook out. My only difference is I want to use the LaserMego vinyl cape and a casting of the KidBiz Batman head to get the Adams/Aparo look I've always wanted. I was wondering about using the glove hands for magnetic-style cuffs -- so that does work? It seemed to work for Brian, I haven't trimmed mine yet. Your head idea is good, too. I've wondered about that head for Space Ghost, too. Last edited by PNGwynne; Dec 4, '18 at 10:03 PM.